You have quite the personality. Your family just loves all of your activities. Hi Bundi from Down Under! Happy Pet of the Day to you! 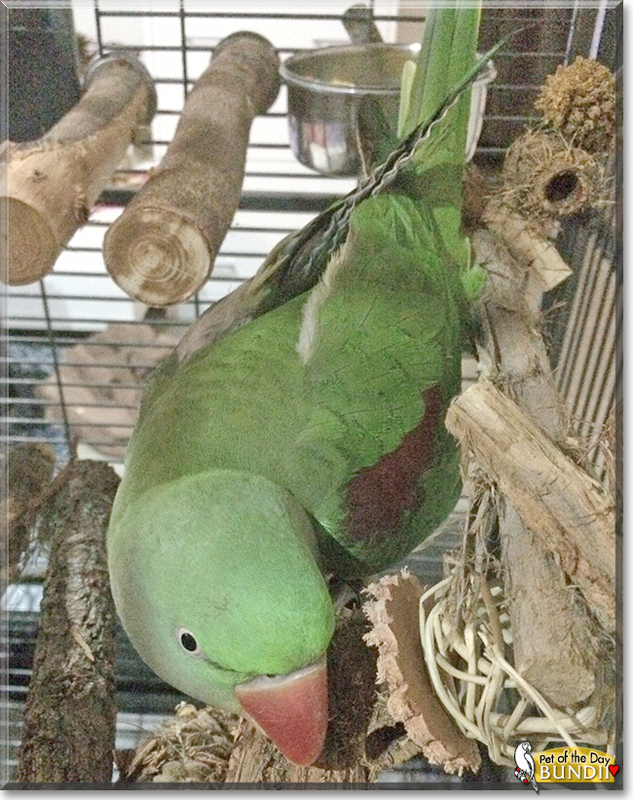 What a beautiful, fun loving, personality packed Alexandrine Parrot you are, Bundi; a character in the best sense of the word; your antics a never ending source of joy and laughter for your humans! Be it your penchant for destroying the junk mail or those infamous blueberry massacres, you certainly keep your mum and dad in stiches and on their toes! There is nothing quite like a blueberry massacre. It usually ends up all over her, the floor and the walls. And she loves that mummy then has to clean up. This is usually where the laughing comes out. How lucky your family is, having a feathered family member as beautiful, as entertaining, as sweet and loving as you, Bundi!! You truly are a gem of a girl Bundi, a treasure, and so very deserving of your big day of honor! Thanks for the BIG smiles, sweetheart! Meeting you today, being treated to all of your heart-melting photos, has been a joy! I hope you're enjoying a very special day of celebration...maybe taking a fun car ride over to your Grandma's; chowing down on apples, pomegranates, carrots and blueberries; taking a dip in your "pool;" cuddling with your mum and dad; being spoiled to the max and loved to bit! Lots of love, gentle cuddles and wee kisses to you, beautiful Bundi, our very special and most deserving Pet of the Day, EVERY day! Dearest Bundii, you are absolutely stunning! 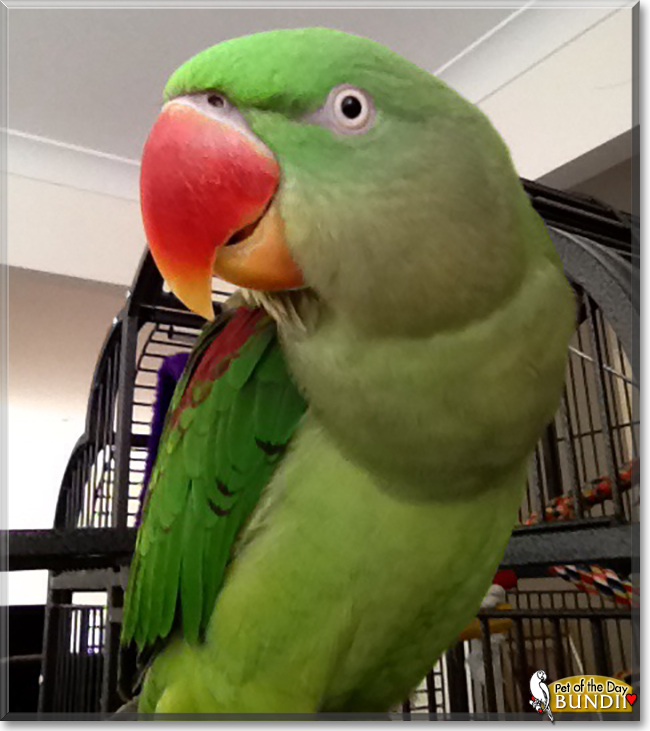 What a beautiful Alexandrine Parrot you are! Your feathers are in such pretty colors, and what a sweet face you have with those wise-looking eyes and that red beak. You look like you are smiling in those great photos (and you probably are)! You have the most delightful personality too, and you make your dear people smile with all your antics and energy. You perform a most valuable service: demolishing the junk mail into a million little pieces! You and your family members all love each other very much, don't you. What a wonderful love-filled home you share! Congratulations, darling Bundii, on being chosen today's Pet of the Day! We hope you and your dear parents and grandma and all your family and friends are enjoying a fine celebration, full of fun and lovies and all your favorite games and treats, maybe a special serving of blueberries, carrot, apple, and pomegranates! Bundii is a magnificent wee bird!! So thrilled to see Bundii is our fine, feathered POTD!